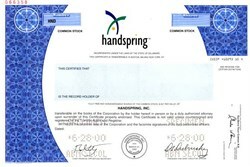 Beautifully engraved specimen certificate from Handspring, Inc. printed in 2000. This historic document was printed by the Security-Columbian Banknote Company and has an ornate border around it with a vignette of the Company's logo. This item has the printed signatures of the Company’s President and Chief Executive Officer, and Chief Financial Officer and Secretary, and is over 11 years old. Handspring was a leading innovator in personal communications and handheld computing. The company's products include the Treo wireless communicators and Treo 90 organizer, the Visor expandable handheld computers, and client and server software for fast Web access from handheld devices and mobile phones. 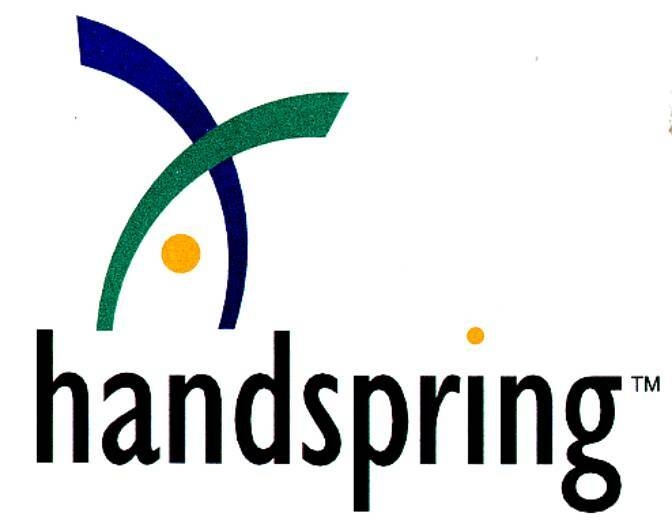 Today Handspring sells its products and accessories at www.handspring.com and through select Internet, retail and carrier partners in the United States, Europe, Asia, Australia, New Zealand, Canada, the Middle East and Mexico/Latin America.